Financial assistance and extended payment options available. Scroll down form more information. Members can view and edit portions of the vegetable items in each week's box through our easy to use online customization. Members will also be able to purchase additional produce and add-on items through their farm account. Try out our ordering DEMO to see how it works! Financial assistance may be available! Scroll down to “Partner Shares” section to learn more. A box of fresh, tasty organic vegetables is delivered to you each week for 20 weeks. Boxes generally consist of 6-12 different vegetable items, with fewer items in the box earlier in the season and more as the season progresses. The season runs from June through mid-October. Standard Share: Our standard size share is a great choice for families, or folks who eat a lot of vegetables each week. The recipes in the newsletter generally accommodate the portions in this size share. $625 for 20 weeks. Small Share: This size share offers smaller quantities of produce with a similar selection of vegetables as the standard share, but not always as much variety. It is best for individuals, couples and people who are trying CSA for the first time. $425 for 20 weeks. Large Share: We often refer to this as the “extra-large” share. This share is geared towards a larger family or those that like to do a little preserving. The large size will be approximately 1 ½ times the Standard Share, offering greater quantities of weekly produce. $825 for 20 weeks. Customizing Your Share: In an effort to give our members some choice about what goes in the share, we offer the option to select or de-select items from your weekly share with an easy to use online program. Members can also choose to add on extra items for additional cost, such as extra produce, organic tortillas and grains. Members who choose not to customize their order will receive the standard box items for the week. See more information about customization at the bottom of the page. Egg Share members will receive 1 dozen certified organic, , soy free, free-range eggs every other week for a total of 10 dozen eggs over the CSA season. Our hen’s diets are also supplemented with soy-free, organic feed. Egg shares sell out early and preference is given to members with vegetable shares. Eggs shares will begin at the same time as vegetable shares. $60. Add a second share for $55.00. Home Delivery Option: A limited number of home delivery service is available for a small weekly fee to members within our delivery areas! Check the "home delivery" box option, and if your address is within the approved range of our delivery area, we will deliver your veggie box right to your door! With our flexible delivery site options, you can choose this option for the season or adjust your delivery site on a weekly basis. Members will be responsible for providing a protected, cool spot to leave the share if no one will be there to accept it. If your address is out of our delivery area/route, delivery approval may remain pending until the season nears, and we may approve your delivery as we finalize our route schedule or if additional addresses are added to your area. If you are applying for a Partner Shares membership, contact us for a sign-up form that can be submitted to FairShare CSA Coalition, or contact FairShare for assistance. Winter share deliveries will begin on November 20. Please note that delivery sites are limited to the farm, Fort Atkinson, Watertown and Good Harvest Market. What kinds of produce can I expect? Healthcare Rebates: As a Fairshare CSA Coalition endorsed farm, members of our farm may be eligible for a rebate of up to $200.00 from their Insurance providers! 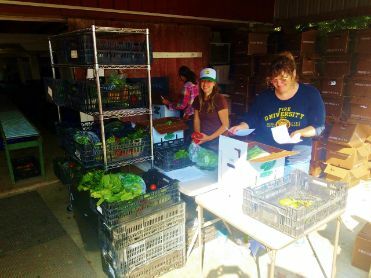 FairShare's Parner Share's program provides financial assistance to limited-income households and eligible organizations to purchase CSA shares from FairShare farms. This program is also eligible to accept SNAP benefits for payment for your CSA share! This program is funded through FairShare's Bike the Barns event, cookbook sales, Farm to Table events and through kind donations from individuals. To find out if you qualify for the Partner Shares assistance program, or to make a donation in support of it, click button below. To support the Partner Shares Program with a donation, include a separate donation check written out to 'FairShare' with your sign-up payment to us, and we will deliver it for you, or visit the Partner Shares page to make your contribution. We understand that from time to time the amount of weekly veggies you need will change. For that reason, we allow you to roll over up to $25 worth of produce from delivery to delivery. This also allows you to get less produce one week and more the next, as your needs change, for no extra cost. This also makes going on vacation no problem. You can cancel your order with the click of a button. We'll credit your swap value so you can get your veggies on a later date during that membership season for no extra cost.